My good friend Rach sent me the next card and I was absolutely happy to receive it. But it almost made me cry, because it reminded me what I lost when she left the Whiff of Joy DT. *buhuuu* ;) her work is unbelievable amazing!!!! She used Lizzie and the christmas tree. Meine gute Freundin Rach schickte mir die zweite Karte und ich habe mich riesig gefreut, dass sie an mich gedacht hat. Aber dann war mir plötzlich zum Weinen zumute, weil mir wieder eingefallen ist was ich verloren habe als sie das Whiff of Joy DT verlassen hat... *buhuuuu* ;) Ihr Werke sind einfach nur großartig!! Sie hat Lizzie und den Weihnachtsbaum verwendet. Last, but not at all least, I want to show you the card I received from Crissy, High Hopes illustrator and Design Diva. You can't properly see it on the picture, but the card is sparkling like crazy, is full of dimension and I love how she did all the backgrounds with just 1 stamp. The central stamp is called "3 pane Santa" from this year's winter release. Die letzte Karte kam von Crissy, High Hopes Illustratorin and Design Diva. Ihr könnt es auf dem Foto leider nicht genau sehen, aber die Karte glitzert wie wahnsinnig und ist voller Dimensionen. Ausserdem finde ich es großartig wie sie all die Hintergründe mit nur 1 Stempel gemacht hat. Der zentrale Stempel heißt "3 pane Santa" und ist von dem diesjährigen Weihnachts-release. Ich danke euch sehr liebe Freindinnen, dass ihr in so einer hektischen Zeit an mich und meine Familie gedacht habt. Oh Wow,da hast Du ja wunderschöne Karten bekommen! Vielleicht magst du mal schauen gehen!? How lucky are you! These cards are stunning!!! I don't know if you have seen it now because Katharina added which stamp Crissy used. 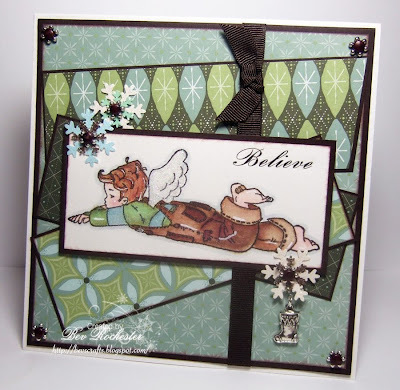 If not it's Three Pane Santa from High Hopes Rubber Stamps. Look at Katharina's post again, she put a link to the stamp. WOW- those are all amazing cards Katharina! As you said, you lost a lot when you lost Rach (but you still have wonderful ladies designing for you!) Just beautiful cards and how honored to have received them. Katharina what wonderful friends you have! Love all the cards you received! So beautiful cards! But I must say that I loved the one from Crissy most!!! I couldn't and wouldn't want to choose which one I like best - they are all so beautiful. I like the sound of the stamp kit - need to know more!!! These are all wonderful! I really love that little Lizzie!